A Palaeolithic Cleaver from the Sahel: Freak or Fact? "Toute l'étude du Paléolithique Nigérien reste à faire" lamented Mauny (1949: 145). Now, fifty years on, an unexpected surface find at the second millennium AD walled site of Kufan Kanawa adds to a growing body of evidence of Early Stone Age human activity in the West African Sahel. 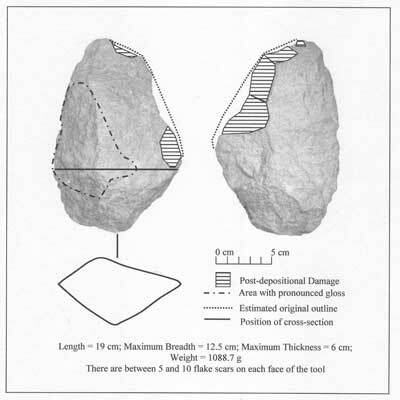 A Palaeolithic Large Cutting Tool (LCT), of the sort familiar to archaeologists working on East African sites such as Olduvai Gorge, Olorgesailie, and Kalambo Falls (Leakey and Roe (eds. ), 1994; Isaac, 1977; Clark (ed. ), 2001) was recovered during fieldwork at Kufan Kanawa in February 2003 (Figures 1, 2). The artefact (Figures 3, 4) is made of a local metamorphic quartzite and relatively recent damage, particularly along one side of the artefact, reveals that the raw material is grey and translucent with a greasy lustre and granular texture when fresh. Over time the surfaces exposed by the Palaeolithic tool-maker have weathered to become rounded, in places glossy, and rich brown in colour (Munsell 7.5YR5/4). 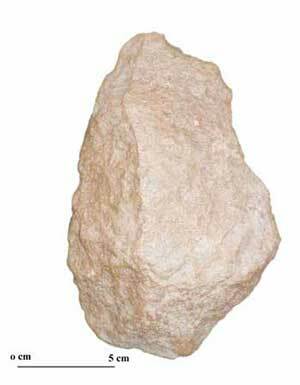 Typologically speaking, the current form of the artefact is suggestive of a slightly asymmetrical handaxe. However, taking into account the form of the original flake scar surfaces and the effect upon this morphology of more recent damage, it seems likely that the tool was originally fashioned as an angled cleaver (e.g. Roe in Leakey and Roe, 1994: Fig. 8.1b) with somewhat divergent edges and a slightly asymmetrical outline when viewed in plan (Roe, pers. comm., 2003). Significantly, the original flake scars are rather shallow, with only slight negative bulbar depressions, which suggests that a soft hammer (bone or hard wood) may have been used - a technique that appears to have been developed between 780,000 and 500,000 years ago (Sharon and Goren-Inbar, 1999; Clark, 2001: 14). 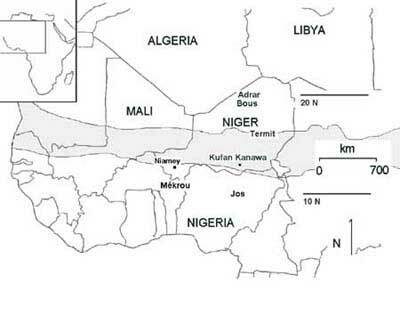 Figure 1: Location of Niger and of Kufan Kanawa. Shaded area indicates general position of Sahelian savanna. Figure 2: Kufan Kanawa - general view. The large cutting tool was recovered amongst the rocks in the foreground. The context of the Kufan Kanawa find is typical of West African Stone Age archaeology in that it provides no stratigraphic, biostratigraphic or radiometric opportunities for dating (Fagg, 1956; Vernet, 1996; Idé, 2000). However, due to the paucity of documented Early Stone Age evidence in West Africa as a whole and the Sahel region of Niger in particular, the significance of the Kufan Kanawa cleaver is very great. Indeed, to our knowledge, there are no other Palaeolithic findspots within a 350 kilometres radius of Kufan Kanawa. 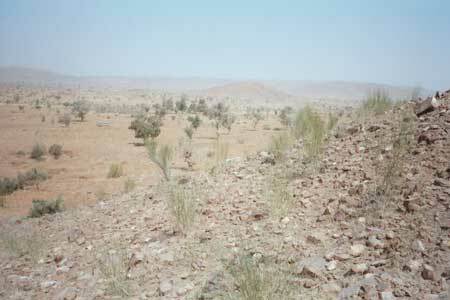 At this distance, relatively well-documented assemblages originate from the Jos Plateau to the south and the Termit massif to the north (Figure 1). At the northern end of the rocky Termit massif, two Palaeolithic surface scatter sites sit on the modern fringe of the Sahara (Quéchon, 1983: 9-11). The assemblages include bifaces and Levallois flake production but also tanged pieces ("à tendance pédunculée") and are attributed by Quéchon (ibid) to the late Acheulian. Perhaps a better comparison for the industry represented by the Kufan Kanawa cleaver is provided by the Jos plateau sites. Here, Palaeolithic bifaces were recovered from considerable depths (14 metres) in tin-bearing gravels (Fagg, 1956; Shaw, 1978). Fagg (1956) remarked on the predominance of cleavers, frequently with oblique cutting edges and parallelogram cross-sections. The Kufan Kanawa artefact appears to have been manufactured in this style; a cleaver from a river terrace on the Jos Plateau (Shaw, 1978: Fig. 7.2) also provides a close parallel. Widening the net, Palaeolithic artefacts have been documented in two further areas, some 750 kilometres from Kufan Kanawa: the Mékrou valley (to the west) and Adrar Bous (to the north). The Mékrou lithic scatters are characterised by handaxes (typically thick, biconvex in section, exhibiting evidence of soft-hammer flaking and often asymmetrical), spheroids, and an absence of Levallois techniques; they are dated, on typological grounds, to between 65,000 and 300,000 years old (Idé, 2000). At Adrar Bous an industry of large, finely finished cutting tools with a high proportion of bifaces was recovered from the surface of three 30 x 30 metre areas and is probably of late Acheulian date (Clark 1980:539-540; 2001:10). The most significant recent development in Palaeolithic studies of Niger has been the recognition that settlement was not, as had been assumed, limited to the Saharan (northern) half of the country but also included the Sahel. Despite variations in ecology and climate over the course of the Pleistocene it seems probable that during long periods of time the area will have provided a resource-rich and hospitable environment. The Kufan Kanawa artefact adds another piece to this puzzle. In our opinion it is plain that the importance of Acheulian occupation of the Sahel is vastly under-recognised. Slow pace of research and landscape changes linked to climatic fluctuation are the explanation; much discovery so far has relied on natural or industrial soil disturbance exposing artefacts at great depths - erosion in the Mékrou, tin mining on the Jos Plateau. Added to this are the difficulties inherent in identifying quartz and quartzite artefacts (see Inskeep, 1988, and Soper, 1965, who speaks of the "evil and ubiquitous quartz"). It is perhaps worth noting that the Kufan Kanawa piece was made from quartzite with small, compact crystals (approximate diameter 1 millimetre), which could be expected to flake moderately well compared with coarser grained rocks like the Naibor Soit quartzite much used at Olduvai (see Jones in Leakey and Roe, 1994: 256-257). Experimental knapping will clarify this hypothesis. We are grateful to Derek Roe and Chris Doherty for their expert knowledge, and to Mahamadou Diori for finding the implement in the first place. We note with great sadness the death of Ray Inskeep who was a mentor and inspiration to both of us. He will be sorely missed in the African archaeologist community and wider afield. CLARK, J. D. 1980. Human populations and cultural adaptations in the Sahara and Nile during prehistoric times. In Faure, H. and Williams, M. (eds.) The Sahara and the Nile - Quaternary environments and prehistoric occupation in northern Africa. Rotterdam: A. A. Balkema, 527-582. CLARK, J. D. ed. 2001a. Kalambo Falls Prehistoric Site, Volume III. Cambridge: Cambridge University Press. CLARK, J. D. 2001b. Variability in primary and secondary technologies of the Later Acheulian in Africa. In MILLIKEN, S. and COOK, J. eds. A Very Remote Period Indeed, papers on the Palaeolithic presented to Derek Roe. Oxford: Oxbow Books, 1-18. FAGG, B. 1956. An outline of the Stone Age of the Plateau minesfield. Proceedings of the Third International West African Conference, Ibadan, Nigeria, 12-21 December 1949. Lagos: Nigerian Museum, 203-222. HAOUR, A. 2000. The former Kano? Ethnoarchaeology of Kufan Kanawa, Niger, Antiquity 74: 767-768. IDÉ, O. A. 2000. Préhistoire dans la vallée de la Mékrou (Niger méridional), Noukchott and Niamey : Centre régional inter-africain d�archéologie/Institut de Recherches en Sciences Humaines. INSKEEP, R. 1988. Africa: everything but flint. In MACRAE R. & MOLONEY, N. eds. Non-flint stone tools and the Palaeolithic occupation of Britain. Oxford: British Archaeological Report series. ISAAC, G. L. 1977. Olorgesailie: Archaeological Studies of a Middle Pleistocene Lake Basin in Kenya. Chicago: University of Chicago Press. LEAKEY, M. D. and ROE, D. A. eds. 1994. Olduvai Gorge, Volume 5: Excavations in Beds III, IV and the Masek Beds, 1968-1971. Cambridge: Cambridge University Press. MAUNY, R. 1949. État actuel de nos connaissances sur la préhistoire de la colonie du Niger, Bulletin de l'Institut Français d'Afrique Noire 11: 141-158. ROEBROEKS, W. & VAN KOLFSCHOTEN, T. eds. 1995. The earliest occupation of Europe. Leiden: University of Leiden. SHARON, G. & GOREN-INBAR, N. 1999. Soft Percussor Use at the Gesher Benot Ya'aqov Acheulian Site? Journal of The Israel Prehistoric Society 28:55-79. SHAW, T. 1978. Nigeria - its archaeology and early history. London : Thames & Hudson. SOPER, R. 1965. The Stone Age in Northern Nigeria. Journal of the Historical Society of Nigeria 3 : 175-194. VERNET, R. 1996. Le sud-ouest du Niger: de la préhistoire aux débuts de l'histoire. Niamey and Paris: Institut de Recherches en Sciences Humaines/Sépia.